We all surf the internet looking for small aluminum boat designs. A customer from St Thomas asked us to come up with something that was 12'. The problem in ST Thomas is anything over can not tie up at the free dingy docks. 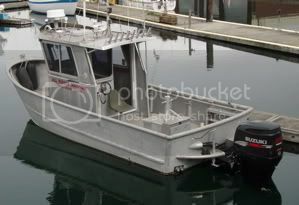 Instead of re-inventing the wheel, I recommended he look at Metalboat kits 12 ft skiff. The customer purchased the license to build two boats. We saved a little by nesting two boats,the two boats cut where about $2500. It was a little of work to roll the rub rail. For the most part it went together well. We filled the front and rear compartments with two part foam,as per the instruction. They a lot of work if you where trying to built them and sell them. I not sure you could get $4,000 each for them. Even at that its still alot of work. I imagine that you could build an 18' version for about the same labor. Thats why all builders seem to migrate to larger models over the years, doesn't cost that much more to build something that sells for 3x as much. Nice looking skiffs, I bought one license years ago when I thought about doing a beginner project but never built it. I bequeathed the licence to Goatram but I don't think he has done anything with it either.